On Tuesday, NPR featured a segment on the difficulties of balancing work and family, but this time with an interesting twist: all the women interviewed were in the military. NPR's Michelle Martin discusses the problems military moms face with a panel of three women who have dealt with them firsthand. She asks them about the recent case of Lisa Pagan, the mother who brought along her children when she reported for duty. Pagan received an honorable discharge after arguing that she was unable to be deployed abroad due to her responsibilities to her family. Surprisingly, all three of the women disapprove - to varying extents - of Pagan's choice. "When you are a military parent, you have to have that a plan B of who is going to take care of my child when I deploy, because it's not a matter of if you will deploy, but when you will deploy," says Lt. Carey Lohrenz. 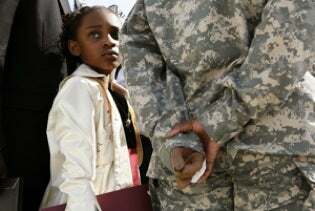 She goes on to remind us that military dads face the same problems, and it is the job of both the parents and the military to figure out an adequate system of childcare: "Military parents need affordable, dependable childcare when children are young... All service members across the board require more family support services. It is not just the women." Lt. Linda Maloney agrees that it is the responsibility of the military to "support [enlisted parents] and the family members that are left behind." While she believes that Pagan should have better planned for the possibility of being called for duty, she also would like to see the military rethink the way they deal with mothers on duty. Pilar Arteaga, a petty officer first class in the Navy, is a single mother, which makes her situation somewhat different. Her pregnancy was unexpected, which only made it more difficult to deal with the challenges of military life. For her, the biggest issue of being a woman in the navy is the constant struggle to "prove yourself" to the men. She feels that the "single parent card" is played far too frequently, and that women like Pagan end up making military moms look bad. Ultimately, Lt. Lohrenz calls for the military to educate continuously: "It goes back once again to being a leadership challenge...not just a one time, one lecture initiative, but ongoing training to help prevent unplanned pregnancies... I think it is leadership, leadership, leadership."